An exhaustive bibliography about Northwest Indiana is beyond the scope of this page. Presented here are some of the more recent books. Linda Simon and Jane Ammeson put together this great illustrated history of Miller in 2012. The Amazon.com description: Miller Beach, known for its eclectic charm, became a popular tourist destination in the early 1900s thanks to its windswept sand dunes and Lake Michigan shoreline. An early aviator, Chicagoan Octave Chanute, glided his aircraft over the dunes almost 10 years before the Wright brothers' flight at Kitty Hawk, and botanist Henry Chandler Cowles studied plant succession in Miller Woods, now part of the Indiana Dunes National Lakeshore. Like its citizens, Miller Beach's architecture is diverse, with historic park buildings designed by George W. Maher: the Marquette Park Pavilion and the Gary Bathing Beach Bathhouse, recently renovated as a museum that honors Chanute and the Tuskegee Airmen. Miller Beach contains other historic structures: Miller Town Hall dates to 1911, the old railroad depot houses a restaurant, the 1910 Miller School is home to a community arts group, and Ayers Realtors remains in its 1926 building. 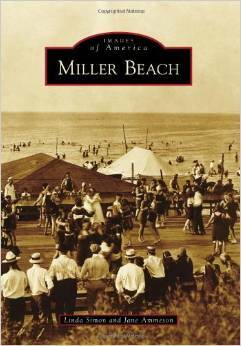 Miller Beach is now a part of Gary, Indiana, and the draw of the beach remains a timeless part of its past, present, and future. A wonderful 'coffee-table' book illustrating the Dunes region. An indispensable guide to the geological history of the region. The Amazon.com description: The landscape of the Calumet, an area that sits astride the Indiana – Illinois state line at the southern end of Lake Michigan was shaped by the glaciers that withdrew toward the end of the last ice age — about 45,000 years ago. In the years since, many natural forces, including wind, running water, and the waves of Lake Michigan, have continued to shape the land. 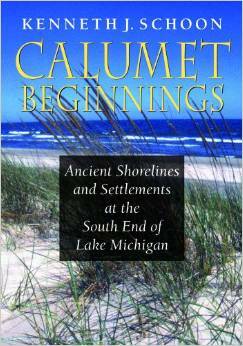 The lake's modern and ancient shorelines have served as Indian trails, stagecoach routes, highways, and sites that have evolved into many of the cities, towns, and villages of the Calumet area. People have also left their mark on the landscape: Indians built mounds; farmers filled in wetlands; governments commissioned ditches and canals to drain marshes and change the direction of rivers; sand was hauled from where it was plentiful to where it was needed for urban and industrial growth. These thousands of years of weather and movements of peoples have given the Calumet region its distinct climate and appeal. Ronald Cohen, Professor of History at Indiana University Northwest, has collaborated with Stephen McShane, the Archivist of the Calumet Archives, in editing this beautiful new book which details the history of the South Shore Railroad Posters so familiar to anyone who knows Northwest Indiana. 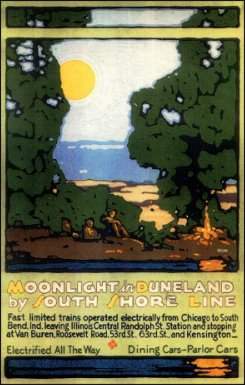 From the dustcover flyleaf: As many as fifty color lithographed posters displayed in railroad depots, on Chicago "L" platforms, and elsewhere, highlighted fun in the Indiana Dunes, local flora and fauna, and the strength of heavy industry, all characteristic of the Calumet Region. Prominent Chicago artists rendered these scenes, and many won acclaim for high artistic standards. Indeed, Oscar Rabe Hanson's Homeward Bound by South Shore Line won both the Art Directors Club and Barron Collier medals in 1927. Moonlight in Duneland tells the story of that poster campaign through the reproduction of the thirty-eight known surviving posters. Additional advertising items from the 1920's and 1970's are sprinkled throughout the book, along with original art by Dale Fleming, Mitchell A. Markovitz, Alice Phillips and John Rush. 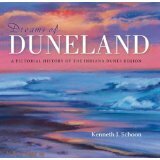 In addition, four essays describe the background... Moonlight in Duneland is published by the Indiana University Press. It's beautiful. In folio size, thirteen inches by ten, the reproductions are generous, and the book also lists where full size posters may be purchased. The book is available from Indiana University Press. You can also pick up or order a copy at the Lake Street Gallery in Miller.